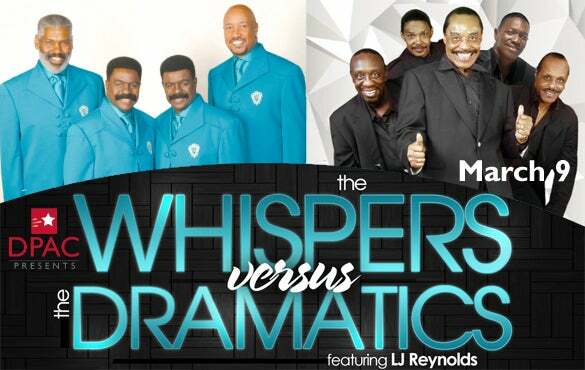 January 4, 2013 (Durham, NC) – Be sure to visit DPAC, Durham Performing Arts Center, on March 9, 2013 as they play host to The Whispers and The Dramatics who will battle to see who reigns supreme as R&B's best. This once-in-a-lifetime show is presented in partnership with the DOME Group. Friends of DPAC members may place their orders on January 10. Joining Friends of DPAC is free, and you can register at www.DPACnc.com/friendofdpac. "To feature not one, but two legendary groups whose bodies of work have been so influential over the past 4 decades is such an honor for us", says promoter Sulaiman Mausi of The DOME Group. One of R&B music's most beloved and consistently popular vocal groups, The Whispers, began their legendary and timeless career in 1963. After two decades of hits, their first platinum album The Whispers (1980) highlighted their biggest hit "And The Beat Goes On" as well as "A Song For Donny," a song written by Carrie Lucas in memory of Donny Hathaway. It was their most successful album (double platinum). The neoclassic "Lady," written by group member Nicholas Caldwell, is still a favorite at concerts. 1987's Just Gets Better with Time went platinum. It featured the R&B number 1 and US Top 10 pop entry "Rock Steady", a collaboration with Kenneth "Babyface" Edmonds. Their vocal style harkens back to a more genteel era of crooning, preferring soft pillow talk and songs that speak to heartfelt emotions. They are arguably the most celebrated R&B balladeers of their generation and still make women swoon with the silky yet forceful tenors of twins Walter and Wallace ‘Scotty’ Scott. They boast four decades of pop and R&B favorites, seven gold albums, two platinum albums, 12 top twenty singles, 40 charted hits since 1970, American Music Award nominations, Soul Train Award nominations, Grammy® Award nominations, 2003 Vocal Group Hall of Fame induction, 2005 Regional Grammy® Governors Award, and the 2002 NAACP Image Award. The Dramatics have been one of the most prolific and entertaining groups of the last three decades. The Dramatics were a typical '60s stand-up vocal group, specializing in romantic ballads, but ably made the transition to the disco era in the late '70s with aggressive dance numbers. Their hits in the '70s included ‘Whatcha See Is Whatcha Get’ (R&B number 3 and pop number 9, 1971), ‘In The Rain’ (R&B number 1 and pop number 5, 1972) and ‘Hey You! Get Off My Mountain’ (R&B number 5 and pop number 43, 1973). In 1973 L.J. Reynolds was recruited by group leader Ron Banks. In 1974 the Dramatics began an association with Los Angeles-based ABC Records. US hits at ABC included the ballad ‘Me And Mrs. Jones’ (R&B number 4 and pop number 47, 1975), ‘Be My Girl’ (R&B number 3, 1976) and ‘Shake It Well’ (R&B number 4, 1977). Switching to MCA Records in 1979, the group secured their last Top 10 hit with ‘Welcome Back Home’ (R&B number 9, 1980). The Dramatics then disbanded in 1982 after Ron Banks left to start a solo career. The Dramatics reunited, with L.J. Reynolds at the helm in the late '80s and continue to the present day, keeping up a busy touring schedule and occasionally releasing a new studio album. Their grasp of superior soul remains as sure as ever.